It started as a fascination with flesh-eating flora. It was the 1960s, and Peter D'Amato ordered a single Venus' flytrap from Famous Monsters magazine. Alas, the plant quickly perished. But soon after, a friend brought him to a bog on the Jersey Shore, where he found thousands of the fly-eating plants growing wild. He was hooked, and by the mid-'80s, D'Amato had moved to San Francisco and claimed to have accumulated the largest personal collection of hungry potted plants in the United States. Soon enough, they devoured D'Amato's life, too. He left his job as a resort manager and opened California Carnivores, a nursery that sells nothing but carnivorous plants--more than 1,000 varieties in an 11,000-square-foot space in Sebastopol, Calif. But that wasn't enough. He also created a way to safely ship them anywhere in the country, and the mail-order business was born. Stranger still, there were plenty of takers. Customers, from the avid collector to the first-time buyer, wanted to get their hands on a spiky Venus' flytrap or hairy sundew. 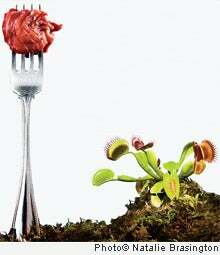 Each specimen sells for about $20, and last year, the nursery grossed about $200,000--making California Carnivores the largest American retailer of predatory plants. During the 40 years D'Amato has been cultivating them, he has become an authority. In 1998 he wrote the definitive book on the subject, The Savage Garden, which is now in its eighth printing. He also helped found the Bay Area Carnivorous Plant Society. Meanwhile, D'Amato is breeding new varieties (don't think about that too long) and importing more exotic ones from overseas. Carnivorous plants generally feed on small insects, but they've been known to take down frogs, rats and birds. Some experts even argue that Venus' flytraps could fully digest a human being, given the chance. "Carnivorous plants are very bizarre, and many of them are almost animal-like in their appearance," D'Amato says. "Growing them is more like having pets than having plants."